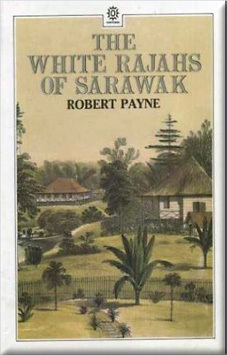 Robert Payne's book on the White Rajahs of Sarawak provides a perfectly readable overview of the lives of the three Brooke family members who ruled over such an unlikely territory for over a century between them. In many ways, I may have been perfectly contented with the structure and organisation of this book if I hadn't recently read Emily Hahn's James Brooke of Sarawak which was written just a few years earlier than this book. And although Emily Hahn's book feels more dated in the language and structure of the book, I feel I got a much more comprehensive understanding of the motivations and reasons for the decisions taken by James Brooke in coming to power and in the manner of his ruling over Sarawak. Of course, the big disadvantage of Emily Hahn's book is that it only focuses on the first of the three Rajahs and so if you are interested in the dynasty as a whole, clearly Payne's book is more useful. However, given that I had so many questions regarding Robert Payne's coverage of James Brooke's life, I couldn't help wandering if I was being similarly short-changed in the accounts of Charles and Vyner Brookes' lives. This is particularly of concern when it is realised that James Brooke receives 118 of the 182 pages whilst the other two Rajahs had to content themselves with splitting the remaining 60 odd pages between the two of them! Robert Payne starts with a biographical overview of James Brooke's early life and explains his time at school and his service in the East India Company and how a wound ended up forcing him to quit the service and look for a life of adventure elsewhere. He recounts his arrival in Borneo but does not explain the backstory in any great detail of how he came to have a letter of introduction to Raja Muda Hashim. This early connection was critical in kicking off a positive relationship to such a key mover within the political movers and shakers of Sarawak. He gives a brief overview on how James Brooke was given the post of Raja but barely gives any of the political back story for how this was converted into a perpetual title that could be bequeathed to his heirs. Surely this is the nub of the entire book and should have been expounded upon and explained especially given that Robert Payne clearly had access to Emily Hahn's writings which do the transfer of titles far more justice than Robert Payne manages. Similarly, the author skims over the enquiry that did so much, according to Emily Hahn, to shape James Brooke's confidence, policies and attitudes towards Sarawak and its relationship to Britain. Furthermore, Robert Payne claims that the issue was 'unresolved' which was clearly not the case given that the two commissioners wrote comprehensive judgements that were published and were acted upon accordingly. Again, Emily Hahn does a far more compelling job at explaining these intricacies which had such substantial consequences one way or the other. Robert Payne does do a better job than Emily Hahn in the closing years of James Brooke's life in England although even here he briefly skips through the protracted and important battles of succession between which nephew should succeed him and why. It is mentioned but given far less space and analysis than it requires. By this stage of the book I was convinced that Robert Payne was merely giving a narrative barebones overview for someone with a passing interest in this unusual colonial setup and rarely providing thoughtful analysis or explanations as to the sequence of events and how the key actors responded to them. In summary, this book is a good starting point for anyone who has an interest in what is an intrinsically fascinating family in a wonderfully exotic and unusual setting. However, it will only provide the briefest of overviews and anyone interested in this area of history is encouraged to follow it up with further reading to gain a deeper and more meaningful understanding of its unique history.